What Are Bushings? Important, That's What! Home / Automotive / News / What Are Bushings? Important, That's What! Car owners who have limited knowledge about auto mechanics may not know what bushings are. 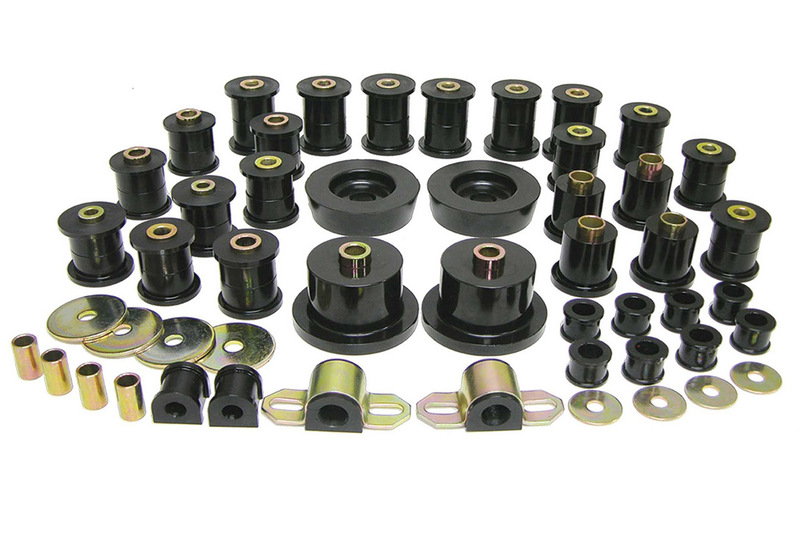 Bushings may sound silly to you, but these components are essential for vehicle suspension. Their purpose has a wide scope. Let’s learn more about car bushings! Bushings are vibration insulators that give some sort of boundary between car components. They reduce the energy being transmitted from one moving component to another. Because of this purpose, vibration is significantly reduced to keep the driver and passengers comfortable inside the car. Although, there are still other factors that cause vibration. In particular, rubber bushings are the most commonly used for cars. Their design helps manufacturers meet the standards of Noise, Vibration, and Harshness or NVH. The influence of Walter Chrysler is the reason why rubber bushings can be found in all modern cars. The first rubber bushings were just utilised as motor mounts. Because of their effectiveness in reducing vibration, these components are now massively produced to be placed anywhere around a car. There are several ways in sorting bushings. Types of bushings can be based on location. Examples are sub-frame mounts, transmission shifter, sway bar links, shock absorber mountings, control arm bushings, alternator bushings and – of course – motor mounts. However, the best categorisation of bushings is through design and material. After all, these two factors are important to produce high-quality bushings. This material is probably the best when it comes to durability and performance. Compared to typical rubber, polyurethane bushings will always be more durable. They are perfect for excellent suspension performance because of their firmness. The polyurethane as a material alone is highly recommended for transmission and motor mounting. Unfortunately, there must be a limit of poly bushings inside a car. When a lot of them are working together in unison, they violate the standards of NVH. Rubber is still the best material for isolating vibrations. Poly bushings can actually be placed on sway bar or shifter bushings and alternator mounts. More than that, they become violators of NVH. Poly bushings also need constant attention. They squeak if they are all dried out. You really have to add lubricant or grease on them frequently. Focusing more on the design, heavy-duty bushings have extra rubber on their material for a more solid form. Several layers of rubber are obviously more durable than one. That design makes the material strong against distortion and rips. Heavy-duty bushings can be noisier than other types especially over literal bumps on the road, but the overall quality is still superb. They are popular as a replacement for factory bushings. Original Equipment Manufacturer bushings stay true to NVH standards. They are the best option for damaged factory hydro bushings if you do not want to change your car’s performance. You can identify a damaged hydro bushing by checking the mount for moisture. Once you spot the greasy residue, the bushing needs to be replaced. Control arm bushings are very susceptible to damage. They usually contain liquid. Same goes for subframe and motor mounts. Hydro bushings are effective in insulating vibrations. Unfortunately, rubber definitely wears out after a long time of constant usage. If that time comes, liquid oozes out of the rubber casing. Damaged bushings can trigger clunking and creaking when you increase the car’s speed or turn a sharp corner. How? 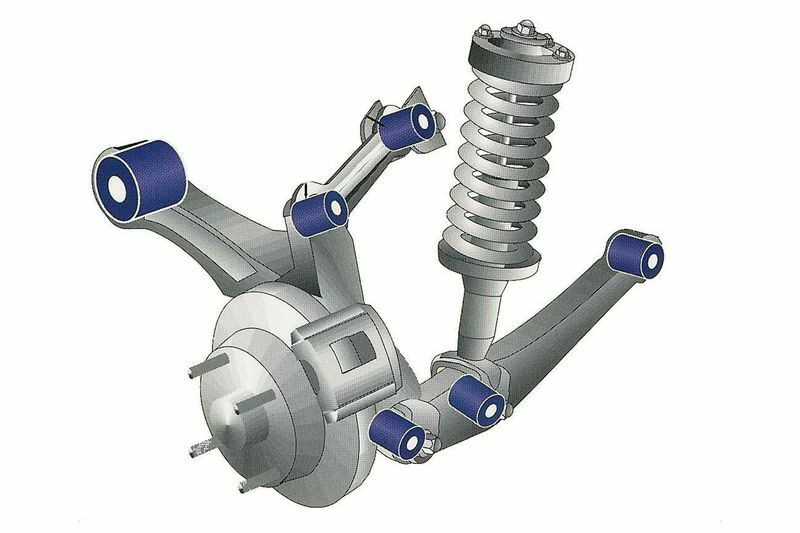 A malfunctioning bushing can make the suspension and frame parts move abnormally. That leads to sounds specifically coming from the steering system of the vehicle. Going further regarding a worn bushing, this damaged component weakens the bond between two car parts. The weak connection results in misalignment. Every time the misaligned parts return to their original positions as the vehicle moves, they make clunking noises which are noticeable due to the rhythmic movement of the car. Meanwhile, bushings that continuously connect to their metal casing because of worn rubber create squeaks as the vehicle is in motion. To solve all these clunks, creaks and squeaks, a mechanic must fix or replace the damaged bushings. Do not be surprised if the mechanic tells you that the root of the problem is just a tiny disc made of rubber. It only proves how important bushings are. For more proof regarding the importance of this kind of symptom or sign, find out possible problems with steering wheel clicks and squealing tyres whenever you turn a moving vehicle around. Soft bushings can be useful because they are better in absorbing noise, vibration, and shock than firm ones. Despite softness, these bushings can even hold the whole suspension system together. Unfortunately, there is a limit when it comes to softness. Too soft and the bushings will excessively flex, leading to sloppy steering and vehicle movement especially when you increase the speed. An accident may happen just because the car does not react fast enough to your steering input. A normal passenger will never be comfortable when the vehicle creates too much noise and vibration while moving down the road. 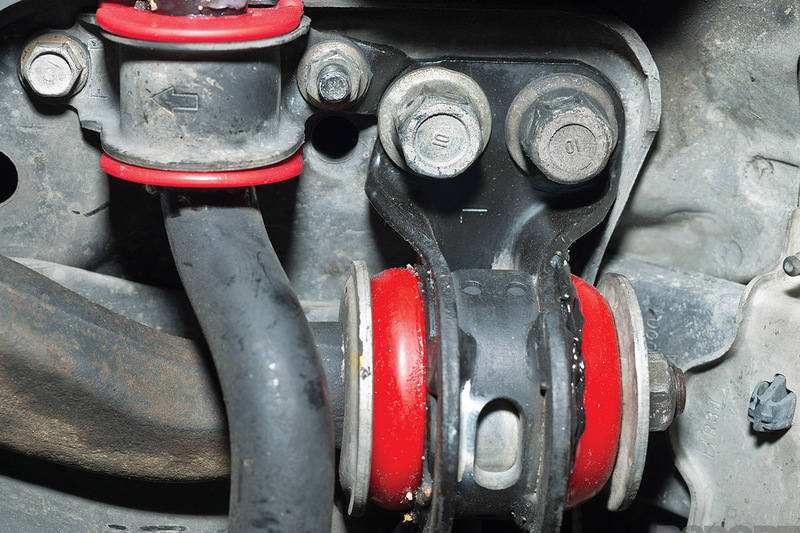 Since the main purpose of bushings is to control vibrations as the energy moves from one part to another, a damaged one can already affect the whole dynamic of the vehicle especially if it connects two big, crucial systems. If you are an expert in DIY work concerning a vehicle, then you might appreciate knowing the standard methods in replacing worn bushings. You will only need a ratchet with sockets, lubricant and rust solution, hacksaw, C-clamp, flat-head screwdriver, grease, and hammer.